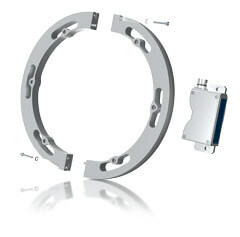 A new magnetic ring encoder strategically segmented to simply fit around large shafts is now available from Leine & Linde. Called the MRI 2000, this new ring encoder meets the challenge that some large machinery OEMs and users face of increasing output power at the same time as reducing weight, such as in wind turbines for example. To meet that challenge, a current trend is to use permanent magnet generators in order to exclude the gearbox and thus decrease the total weight. These solutions often require a velocity feedback encoder mounted on the main shaft between the generator and the rotor blades where the shaft dimension is large – sometimes around a meter. This is where the Leine & Linde MRI 2000 meets the need. Designed with this in mind, the ring encoder is segmented into pieces, something that facilitates simple commissioning and service. As a ring is often mounted on a shaft between other parts in the machinery, it can be difficult to access it, both when first mounting it and when performing service. With a segmented ring, the pieces can be mounted from two sides of the shaft and screwed together. The segments also make handling easier when transporting and storing the ring. Fixing the ring to the shaft can be made through flange mounting with axial screws or by Leine & Linde’s ClampFit solution for simplified commissioning. With ClampFit, the ring segments are screwed together in a way that automatically tightens the ring around the mating shaft. This saves commissioning time and enables fixing to a standard cylindrical shaft without any flange expansion prepared. The speed pickup unit is available with several market standard interfaces for incremental signals. The interfaces High Current HTL and Optolink have been specially designed for long distance transmission, which makes them extra suitable for crane applications or for turbine designs where the encoder signals need to be transferred from the top of the tower down to the ground. Leine & Linde is based in Sweden with exclusive North American distribution through HEIDENHAIN Corporation in Schaumburg, IL. Leine & Linde is well known for offering high quality, heavy duty encoders of both the incremental and absolute type, product robustness, and are designed to cope with the harshest of environments such as those with high vibration, dirt and cold temperatures. These heavy, severe duty encoders are suited for drive and measurement applications and are often found in industries such as pulp and paper, forest and wood processing, agriculture, aggregate and mining equipment.